It is clear that the development of an autoimmune disease usually depends on both a genetic predisposition and an environmental trigger. In this study, we demonstrate that BALB/c mice develop a lupus-like serology following immunization with a peptide mimetope of DNA, while DBA/2 mice do not. We further demonstrate that the critical difference resides within the B cell compartment and that the naive B cell repertoire of DBA/2 mice has fewer B cells specific for the DNA mimetope. Differences in the strength of B cell receptor signaling exist between these two strains and may be responsible for the difference in disease susceptibility. BALB/c mice possess more autoreactive cells in the native repertoire; they display a weaker response to Ag and exhibit less Ag-induced apoptosis of B cells. DBA/2 mice, in contrast, display a stronger B cell receptor signal and more stringent central tolerance. This correlates with resistance to lupus induction. Thus, the degree to which autoreactive B cells have been eliminated from the naive B cell repertoire is genetically regulated and may determine whether a nonspontaneously autoimmune host will develop autoimmunity following exposure to Ag. Several transgenic mouse models have been used to understand the maintenance of tolerance in normal individuals and its breakdown in autoimmunity (1, 2, 3). From these studies, it has become clear that during B cell development, tolerance to self-Ags occurs through a number of mechanisms including receptor revision, anergy induction, and deletion. These mechanisms purge the naive repertoire of most autoreactive B cells. Nevertheless, some B cells with reactivity to self-Ag are routinely found in the periphery (4, 5). In systemic lupus erythematosus (SLE),3 these autoantibodies are directed to a variety of nuclear Ags, including dsDNA (6, 7). The loss of tolerance to self-Ags that is characteristic of SLE is a multigenic phenomenon with contributions from both susceptibility and suppressor loci (8, 9, 10). Genes that control B and T cell function have been implicated in this loss of self-tolerance. The presence of certain MHC class II alleles (11), T and B cell costimulatory molecules CD40 and CD40 ligand (12, 13) CD28-B7.1 (14, 15), or BAFF (16), mutations in apoptosis-regulating genes such as fas, fas ligand, and bcl-2 (17, 18, 19), and polymorphisms causing differential cytokine release (20, 21, 22, 23) altered FcR function (24, 25, 26, 27) or altered B cell receptor (BCR) signaling (28, 29, 30, 31, 32) have all been shown to modulate disease activity. We have developed a model of SLE that requires an antigenic trigger. B cell tolerance is lost in nonspontaneously autoimmune BALB/c mice when they are immunized with a multimeric form of a peptide mimetope of dsDNA (DWEYSVWLSN-MAP, MAP peptide). These mice develop high titers of anti-peptide Abs, anti-dsDNA Abs, and Abs to a variety of nuclear Ags, as well as glomerular Ig deposition (33, 34). This loss of self-tolerance is T cell dependent and requires activation of Ed-restricted helper T cells (35). The T cells that respond to MAP peptide recognize an epitope derived from both the decapeptide and the polylysine backbone, and display no evidence of cross-reactivity with self-Ag. Disease induction is genetically determined. DBA/2 mice, like BALB/c mice, express the H-2d haplotype, but do not develop anti-DNA Abs following peptide immunization. We have determined that the resistance of DBA/2 mice to autoreactivity in this model resides in the B cell compartment. DBA/2 B cells display an increased strength of BCR signaling that leads to greater apoptosis of naive B cells and more stringent negative selection of naive B cells. The resulting peripheral B cell repertoire is less capable of mounting an autoantibody response and thus mediates resistance to an Ag-triggered lupus-like phenotype. Eight- to 10-wk-old female wild-type BALB/c, DBA/2, (BALB/c × DBA/2)F1 mice and SCID BALB/c mice were purchased from either Taconic Farms (Germantown, NY) or The Jackson Laboratory (Bar Harbor, ME). Mice were housed in the Albert Einstein College of Medicine animal (specific pathogen free) barrier facility or in the barrier facility of The Rockefeller University. The peptide DWEYSVWLSN linked to an eight-branch polylysine backbone (DWEYSVWLSN-MAP) was purchased from Research Genetics (Huntsville, AL) and its purity and/or sequence verified by either HPLC or amino acid analysis. Mice were immunized s.c. with 100 μg of MAP peptide in 100 μl of 1/1 PBS:CFA H37 Ra (Difco, Detroit, MI) on day 0 and then boosted in IFA (Difco) on days 7 and 14. The SCID BALB/c mice used in adoptive transfer experiments received 4 × 107 T cells from (BALB/c × DBA/2)F1 mice and 4 × 107 B cells from either BALB/c or DBA/2 mice. Mice were immunized as above 14 days after reconstitution and received an Ag boost in IFA on day 56. Abs to peptide and dsDNA were measured as previously described (34). BALB/c mice were immunized in the right footpads with 100 μg of MAP peptide in 100 μl of PBS/CFA H37 Ra (1/1) and in the left footpads with 100 μl of PBS/CFA H37 Ra (1/1) alone. One week later, cells from the left or right popliteal, axillary, and brachial lymph nodes were harvested separately in RPMI 1640 medium (Life Technologies, Grand Island, NY) supplemented with 5% FCS, 2 mM glutamine, 100 U/ml penicillin, 100 μg/ml streptomycin, and 50 μM 2-ME. Cells were pulsed with various doses of MAP peptide or purified protein derivative (PPD) in triplicate for 72 h.
In order not to activate T cells during the isolation procedure, T cells were purified by negative selection using anti-Ab,d,a and anti-Ed, k, anti-F4/80 (TIB120, HB-198; American Type Culture Collection (ATCC), Manassas, VA), and anti-B220 (BD PharMingen, San Diego, CA) Abs. After depletion, more than 95% of the remaining cells were CD3-positive cells. B cells were purified by incubation with 2.5 μg/ml biotinylated anti-CD43 Ab (clone S7) to eliminate B1 and plasma cells (36) (BD PharMingen) in 0.1% BSA in PBS at a concentration of 4 × 107 cells/ml for 30 min at 4°C followed by streptavidin Dynal beads (Dynal, Oslo, Norway) for 30 min at 4°C. After depletion of CD43+ cells, more than 90% of the remaining cells were B220+ by FACS analysis. Purified B cells from either unimmunized BALB/c or unimmunized DBA/2 mice were cultured with purified T cells from MAP peptide-primed mice for 72 h. [3H]Thymidine (0.5 μCi) was added into each well for the last 8–10 h. Incorporated radioactivity was counted using a Wallace Tomtec harvester 96 Mach III M and a 1450 liquid scintillation Microbeta counter (Turku, Finland). To determine the MHC restriction for MAP peptide, lymph node T cell proliferation assays were conducted as described above in the presence of 50 μg/ml MAP peptide and blocking Abs to I-Ad (MKD6, ATCC HB-3) and I-Ed (1444S, ATCC HB-32; ATCC). These Abs were purified from ascites produced by inoculation of SCID mice with the above cell lines. The purity of the Igs was verified by SDS-PAGE and their concentration was measured by both absorbance at 280 nm and by quantitative ELISA (37). Lymph node T cell proliferation assays were performed as described above. After 72 h, supernatants from each well were tested for the presence of IL-2, IL-4, IFN-γ, IL-10, and IL-12 using the Endogen mouse cytokine ELISA kits (Woburn, MA). TGF-β1 was assayed using the human cytokine ELISA kit from R&D Systems (Minneapolis, MN). Cytokine concentrations were determined based on standard curves. Immulon II 96-well plates (Dynatech Laboratories, Chantilly, VA) were coated with 50 μl of either 10 or 100 μg/ml calf thymus dsDNA overnight at 37°C. Purified B cells were cultured for 48 h with or without LPS (10 μg/ml; Sigma-Aldrich, St. Louis, MO) in RPMI 1640 medium containing 10% FCS at 37°C. B cells were then added to peptide or dsDNA-coated Immulon II plates for 8 h. Biotin-conjugated goat anti-mouse κ Ab (Southern Biotechnology Associates, Birmingham, AL) diluted 1:1000 was added, followed by 50 μl of streptavidin conjugated to alkaline phosphatase (Southern Biotechnology Associates) and 50 μl of 5-bromo-4-chloro-3-indolyl phosphate/1 mg/ml disodium salt (Sigma-Aldrich) in AMP buffer (1 M MgCl2, 0.01% Triton X-405, 9.58% amino-2-methyl-1-propanol (pH 9.8); Sigma-Aldrich). Plates were allowed to develop at room temperature. Spots were counted using an Olympus sZX9 dissecting microscope (Olympus, De Plapo, Japan). Naive B cells were purified and cultured with different concentrations of biotin-conjugated anti-IgM Ab (Southern Biotechnology Associates) for 1 h at 37°C in RPMI 1640 medium with 5% FCS followed by neutralite avidin (Southern Biotechnology Associates) at a 2:1 ratio to anti-IgM Ab. Cells were stained with anti-B220 Ab, fixed in 1% paraformaldehyde, and incubated with 0.4 μg/ml rabbit polyclonal Ab to activated caspase 3 (clone CM1; Idun Pharmaceuticals, La Jolla, CA) or irrelevant rabbit polyclonal Ig followed by PE-labeled goat anti-rabbit Ab (BD PharMingen). Flow cytometry was performed with a FACSCalibur flow cytometer (BD Biosciences, Mountain View, CA) and analysis was performed using FlowJo software (Tree Star, San Carlos, CA). For measurements of calcium responses after anti-IgM stimulation, 107 splenocytes were loaded with 5 μg/ml Indo-1 AM (1-[2-amino-5-(6-carboxy-2-indolyl)phenoxy]-2-(2-amino-5-methylphenoxy)ethane-N,N,N′,N′-tetraacetic acid, pentaacetoxymethyl ester; Molecular Probes, Eugene, OR) at 37°C for 30–60 min and then stained with anti-B220 (RA3-6b2; BD PharMingen) and stimulated with goat F(ab′)2 anti-IgM Ab (Southern Biotechnology Associates). The ratio of fluorescence in violet (400 nm) vs blue (510 nm) was measured with a FACSorter (BD Biosciences). Comparisons between two groups were performed using the unpaired Student’s t test. Error bars represent SEM values. Values of p < 0.05 were considered to be statistically significant. BALB/c and DBA/2 mice were immunized with MAP peptide. By week 6, the IgG response to both peptide and DNA was significantly greater in BALB/c mice than in DBA/2 mice (Fig. 1⇓). There was no significant response to dsDNA in DBA/2 mice following immunization and no glomerular Ig deposition. Thus, there is no pathogenic anti-DNA response present in peptide-immunized DBA/2 mice. Serum anti-dsDNA and antipeptide response. BALB/c and DBA/2 mice were immunized with MAP peptide as described. Sera from different time points were diluted 1/4000 and assayed for IgG anti-peptide Abs by ELISA. At week 6, there was a significant difference in anti-peptide Abs (p < 0.05). Sera from different time points were diluted 1/500 and assayed for IgG anti-dsDNA Abs. By week 6, there was a significant difference (p < 0.05). The data represent averages of five BALB/c mice and seven DBA/2 mice. To determine whether there was a difference in T cell function between DBA/2 and BALB/c mice that might explain the lack of serum response in DBA/2 mice, we analyzed the T cell response to peptide in DBA/2 mice. DBA/2 T cells mounted a T proliferative response to the peptide (Fig. 2⇓A). In fact, while proliferation to PPD was similar for DBA/2 and BALB/c T cells, T cell proliferation to the peptide was higher in the DBA/2 mice. In BALB/c mice, the antipeptide response is mediated by CD4 Ed-restricted T cells (35). The T cell response in DBA/2 mice is Ed restricted as well, since Ab to Ed was able to block T cell proliferation to the peptide from maximal to background levels in a dose-dependent manner, whereas the isotype-matched control Ab to Ad had no effect (data not shown). Furthermore, cytokine production by Ag-specific T cells was the same in BALB/c and DBA/2 mice (Fig. 2⇓B). Primed T cells from both strains produced IL-2 and IFN-γ in response to MAP peptide exposure, but produced no IL-4 or TGF-β. A, T cell proliferation to MAP peptide in BALB/c and DBA/2 mice. Mice were immunized with CFA or CFA and MAP peptide. Cells harvested from their lymph nodes were pulsed in vitro with PPD or MAP peptide as described in Materials and Methods. For each group, data are expressed as the mean cpm of five mice, each done in triplicate. No significant difference in proliferation to PPD is observed between BALB/c and DBA/2 mice. Peptide-specific proliferation is observed only in mice immunized with the peptide (p = 9 × 10−12 for DBA/2 and p = 1.9 × 10−9 for BALB/c). These results are representative of three separate experiments, each containing five mice in each group, all with similar results. 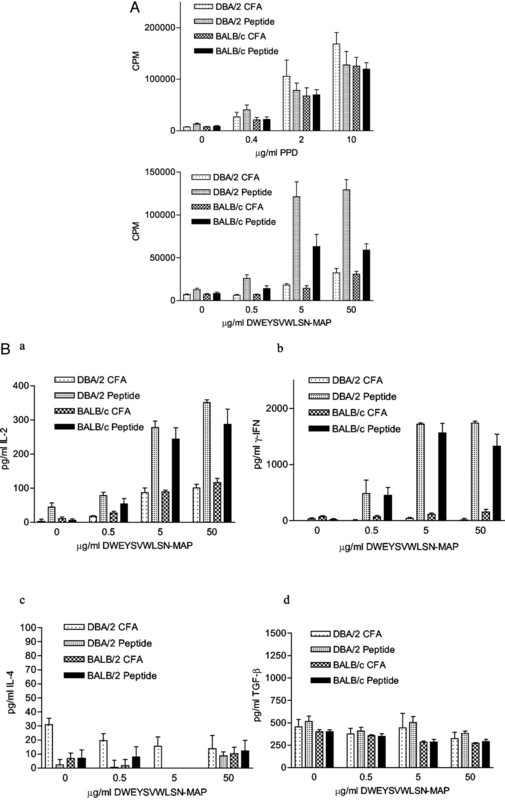 B, Cytokine production in BALB/c and DBA/2 mice following DWEYSVWLSN-MAP immunization. ELISAs were used to assay for the production of IL-2, IFN-γ, IL-4, and TGF-β1 (a–d) by lymph node cells of mice immunized with either CFA alone or MAP peptide in CFA. Data are expressed as the mean cytokine concentration produced by proliferating T cells and APC from five mice, each assayed in triplicate. IL-2 and IFN-γ production are peptide specific, with no significant difference observed between the two strains. IL-4 and TGF-β1 levels are not up-regulated by peptide pulsing and there is no significant difference between the strains. To test whether B cells from DBA/2 mice were responsible for the lack of anti-DNA Ab after peptide immunization, an adoptive transfer experiment was performed. T cells from (BALB/c × DBA/2)F1 mice and B cells from either BALB/c or DBA/2 mice were transferred into BALB/c SCID mice. After 14 days, reconstituted mice were immunized with MAP peptide. SCID mice that received naive B cells from DBA/2 mice displayed fewer B cells secreting Ab to peptide and to dsDNA than SCID mice that received naive B cells from BALB/c mice (Fig. 3⇓). There was no difference in the number of surviving B cells. Since the non-B cell APC and the T cells are the same in the recipient mice in this study, the difference in B cell activation must reflect an intrinsic feature of the B cell population. ELISPOT assay on adoptive transfer experiments. T cells from (DBA/2 × BALB/c)F1 mice were injected into SCID BALB/c with either purified naive B cells from BALB/c or DBA/2 mice. Immunization was performed as described and total splenocytes were assayed for antipeptide reactivity and anti-dsDNA reactivity by ELISPOT. ▪, The SCID mice that received B cells from DBA/2 and T cells from (DBA/2 × BALB/c)F1; ▦, the SCID mice that received B cells from BALB/c and T cells from (DBA/2 × BALB/c)F1 (p < 0.05). Five mice were included in each group. Data represent mean ± SEM. We reasoned that the activation of DBA/2 B cells might reflect an impaired interaction between Ag-specific T and B cells. Ag-responsive T cells would be unable to activate DBA/2 B cells if the B cells failed to process and present the same peptide epitope that was presented by dendritic cells to prime the T cell response. To address this possibility, we assayed DBA/2 and BALB/c B cells isolated from naive mice for their ability to present MAP peptide to primed T cells. Naive DBA/2 B cells can present MAP peptide to primed T cells as efficiently as naive BALB/c B cells (Fig. 4⇓). This observation confirmed that the lack of Ab response represented a strain-specific difference in B cell repertoire or activation and not a difference in Ag presentation. DBA/2 B cells are able to present DWEYSVWLSN-MAP to primed T cells. Briefly, 3 × 105 T cells from BALB/c and DBA/2 mice primed with MAP peptide in CFA were cultured with B cells from naive BALB/c and DBA/2 mice in the presence of 50 μg/ml MAP peptide or in medium alone for 72 h. For the last 8 h, 0.5 μCi of [3H]thymidine was added to each well. For each group, data are expressed as the mean cpm of five mice each done in triplicate. The remaining explanation for the reduced response in DBA/2 mice was an alteration in the repertoire of B cell antigenic specificities. To test for this possibility, we assayed for anti-peptide and anti-dsDNA Ab-secreting B cells in the naive B cell repertoire. DBA/2 mice showed a significantly lower frequency of B cells with each specificity (Fig. 5⇓A). Resting and anergized B cells will not spontaneously secrete Ab, but can be activated with LPS (38). To assay for their presence in DBA/2 mice, we stimulated splenic B cells with LPS. As shown in Fig. 5⇓B, DBA/2 mice have significantly fewer peptide-reactive and dsDNA-reactive B cells than BALB/c mice following LPS stimulation. There was no difference in LPS responsiveness between strains because there was no difference in the number of B cells that were activated to produce Ab in DBA/2 and BALB/c mice (data not shown). 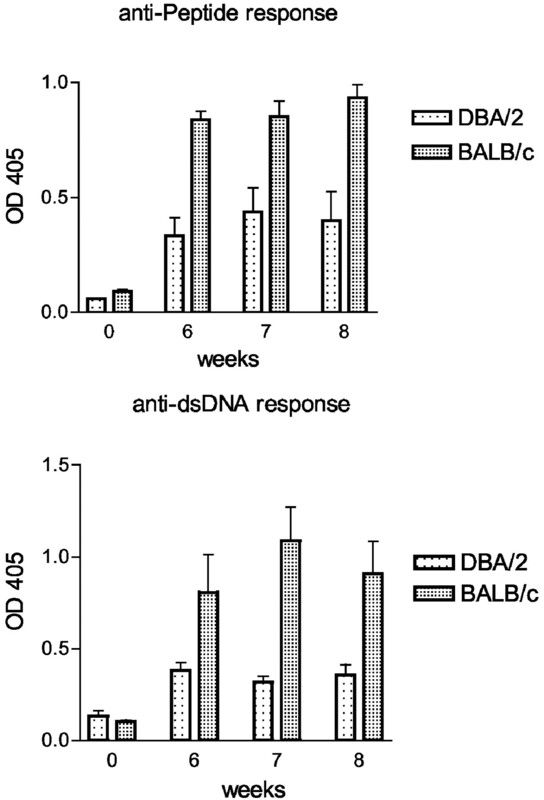 Anti-dsDNA and antipeptide B cells in the naive repertoire of BALB/c and DBA/2 mice. A, Naive B cells were purified using anti-CD43 depletion as described. 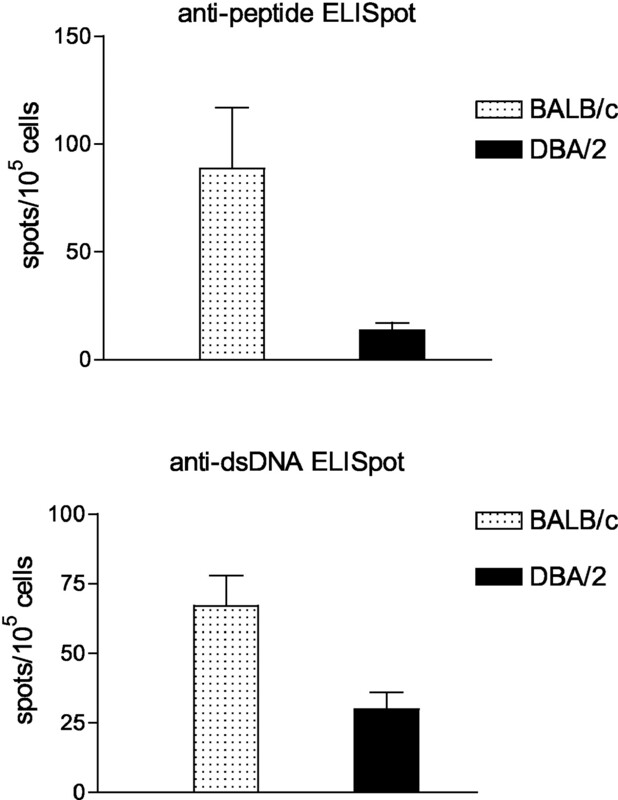 Anti-dsDNA and antipeptide ELISPOT assays showed significant differences in the number of anti-dsDNA and anti-peptide Ab-secreting B cells between BALB/c and DBA/2 mice. B, LPS-stimulated B cells were assayed for anti-dsDNA and anti-peptide Ab production by ELISPOT. The number of anti-dsDNA and antipeptide B cells is significantly higher after LPS stimulation in BALB/c compared with DBA/2 mice. Data are presented as the mean ± SEM. Five individual mice were included in each group. The B cell repertoire is determined through negative selection of immature and transitional B cells. Signaling through the BCR is critical in tolerance induction. Immature B cells encountering Ag in the absence of costimulation are deleted or anergized (2, 39). Since DBA/2 mice display a lower frequency of autoreactive B cells in the naive B cell repertoire, we speculated that B cells from DBA/2 mice might undergo Ag-mediated apoptosis more readily than B cells from BALB/c mice. Anti-IgM can mimic Ag binding and mediate apoptosis of immature B cells. We first determined that B cells from BALB/c and DBA/2 mice express an equal density of membrane IgM (data not shown). We then treated purified B cells with various concentrations of biotinylated anti-IgM Ab and induced hypercrosslinking of BCRs with avidin. As shown in Fig. 6⇓A, B cells from DBA/2 mice showed a higher percentage of apoptotic cells expressing activated caspase 3 in the presence of 10 and 20 μg/ml anti-IgM Ab than B cells from BALB/c mice. 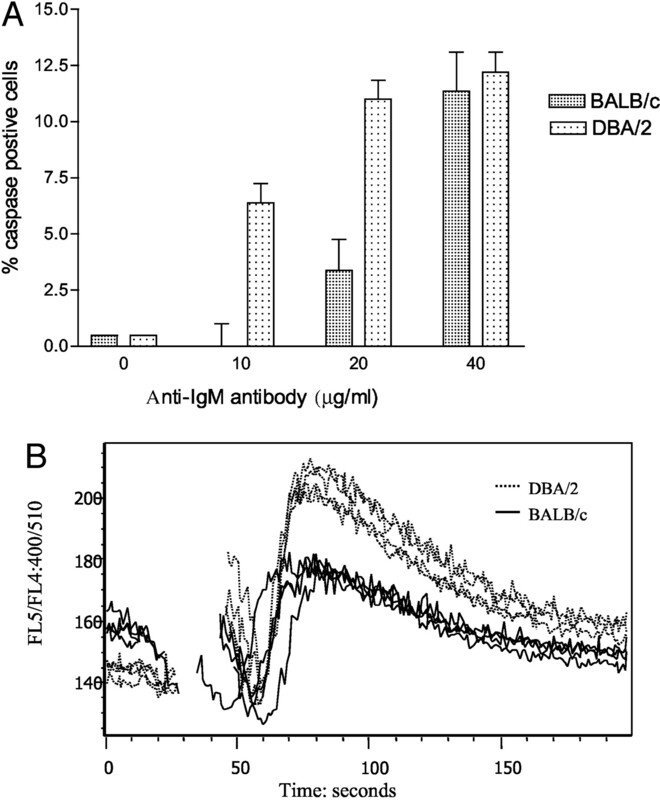 When the concentration of anti-IgM Ab was increased to 40 μg/ml, there was no difference in apoptotic cell number between DBA/2 and BALB/c B cells. This concentration achieves maximum BCR-mediated apoptosis. 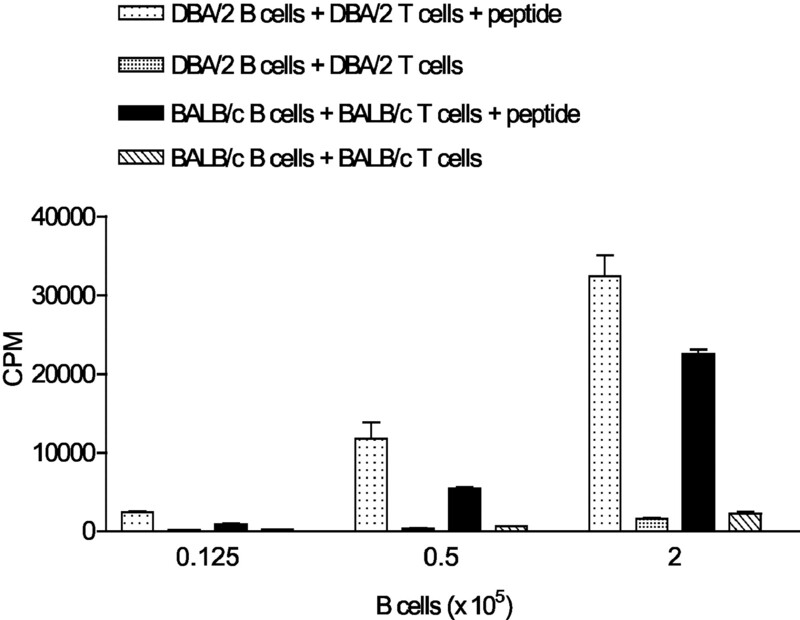 Thus, B cells from DBA/2 mice have a lower threshold for BCR-mediated apoptosis than B cells from BALB/c mice in vitro. B cells from DBA/2 mice are more prone to anti-IgM Ab-induced apoptosis in vitro and show a stronger calcium influx after BCR cross-linking. A, Purified B cells from DBA/2 and BALB/c were treated with different concentrations of anti-IgM Ab and the apoptotic cells were identified by staining with Ab to activated caspase 3. There are a significantly higher number of apoptotic B cells in DBA/2 mice when the cells are treated with either 10 or 20 μg/ml anti-IgM Ab. Data are presented as the mean ± SEM. For each group, five individual mice were included. B, Total splenocytes were loaded with Indo-1 AM, stained with anti-B220 Ab, and then assayed for Ca+ influx after stimulation with 20 μg/ml anti-IgM Ab. The ratio of fluorescence in violet vs blue was plotted against time. Profiles are representative of four mice in each group. Since cross-linking BCRs induced a higher rate of apoptosis in DBA/2 B cells, we analyzed the strength of signaling through the BCR. When we stimulated B220+ cells with anti-IgM, the calcium response was greater in DBA/2 B cells (Fig. 6⇑B). The increased strength of BCR signaling is consistent with the greater apoptosis induced by anti-IgM Ab and with a lower threshold for BCR signaling in DBA/2 mice. Thus, it follows that autoreactive B cells would be deleted on exposure to lower concentrations of Ag in DBA/2 mice, negative selection would be more stringent, and B cells having BCRs with lower affinity for self-Ag would be deleted. The maintenance of self-tolerance is a major challenge to the immune system. Many dysfunctions in immune cell regulation lead to a lupus-like phenotype. The models of SLE that have been most extensively studied are the MRL/1pr and the NZB/W F1 mouse strains. These strains both develop a SLE-like disease spontaneously and display not only autoantibody production but also an abnormality of the T cell repertoire or of T cell function (40, 41). We have developed a mouse model of SLE-like autoimmunity that requires both a genetic predisposition and exposure to an environmental factor for disease expression. The model we use has the advantage of being precipitated by a known antigenic stimulus, a peptide mimetope for dsDNA. Thus, Ag-specific T cells and B cells can be characterized. This SLE-like syndrome, characterized by the production of anti-peptide and anti-dsDNA Abs as well as glomerulonephritis, is dependent on Ed-restricted CD4+ Th1 cells (35). Previous studies have shown there is no evidence that the peptide-reactive T cells are autoreactive. Thus, this model is one in which T cells that are activated by foreign Ag provide help for cross-reactive anti-peptide and anti-DNA B cells, and autoreactivity lies within the B cell compartment. In this study, we show that DBA/2 mice, which share the MHC haplotype with BALB/c mice, mount a less robust humoral response to MAP peptide and thus avoid pathologic autoreactivity. The titer of anti-peptide and anti-DNA Abs is ∼8-fold greater in BALB/c mice (data not shown). In clinical assays, a titer of anti-nuclear Ab of 1:40 is considered normal, whereas a titer of 1:160 is consistent with SLE. Thus, in the clinic, even 4-fold increases in Ab titer can make a significant difference with respect to disease expression. Data from studies of the T cell response to MAP peptide and adoptive transfer studies with DBA/2 or BALB/c B cells and F1 T cells demonstrated that an intrinsic B cell difference accounts for the diminished Ab response to peptide in DBA/2 mice. This is the only model of induced autoimmune disease in which genetic susceptibility to disease has been shown to be exclusively a B cell property. The absence of a cross-reactive anti-DNA response results from a “hole” in the repertoire of B cell antigenic specificities. An explanation for this hole or absence of potentially autoreactive B cells comes from the studies of BCR signaling and BCR-induced apoptosis in BALB/c and DBA/2 mice. There is greater BCR signaling and greater susceptibility to negative selection in DBA/2 B cells. We and others have previously shown that splenic B cells that undergo apoptosis following BCR signaling are transitional B cells (42, 43, 44). During B cell development, B cells with autospecificity are deleted or anergized, markedly reducing the potential for autoantibody production. Studies of mice with transgene-encoded BCRs have demonstrated that there is a threshold of BCR ligation required for signaling for tolerance induction (45). Studies of transgenic mice overexpressing molecules involved in BCR signaling have shown that this threshold is genetically determined (28, 29, 30, 31, 32) and that B cells that may ordinarily be tolerized are indifferent, or fail to be signaled by autoantigen, if the strength of BCR signaling is altered. Craft and colleagues (46) have demonstrated an altered threshold for T cell activation in MRL mice with T cells from this autoimmune background showing greater TCR signaling in response to a low affinity ligand than T cells from a nonautoimmune background. T cell hyperresponsiveness appears to map to a SLE susceptibility locus in NZM mice (47). In our model, there is no evidence for altered T cell function. DBA/2 T cells recognize MAP peptide. Furthermore, both BALB/c and DBA/2 T cells up-regulated IL-2 and IFN-γ in a dose-dependent fashion, whereas IL-4 and TGF β levels were unchanged. Overall, these results indicate that the T cell response does not account for the maintenance of self-tolerance in DBA/2 mice. Studies of transgenic mice and mice with targeted gene deletions have demonstrated that alterations in expression of BCR coreceptors, components of the BCR or coreceptor signaling cascades, FcRII, or costimulatory molecules can affect thresholds for B cell survival and activation. In these animals, differences in levels of protein expression are dramatic and the mice display spontaneous autoimmune disease. Our data demonstrate that a B cell autonomous difference between two nonspontaneously autoimmune hosts can predispose to Ag-induced autoimmunity. Each strain, in the absence of immunization with MAP peptide, is immunocompetent with no detectable compromise in immune function. DBA/2 B cells, however, display enhanced BCR signaling to Ag. This results in enhanced apoptosis of immature cells in response to the same antigenic stimulus. It is consistent with previous reports that splenic DBA/2 B cells have a more activated phenotype than splenic BALB/c B cells and are more responsive to proliferative signals (48). Interestingly, it is also consistent with studies of the Ab response to N-acetyl glucosamine coupled to BSA in BALB/c and DBA/2 mice. The BALB/c response displays significantly more cross-reactivity with cardiac myosin (A. Kuan and B. Diamond, unpublished data). Thus, the DBA/2 cell repertoire cannot be easily induced to autoreactivity. Although some models of lupus are characterized by B cell hyperactivity, this study suggests that a diminished response to Ag can result in autoimmunity due to diminished tolerance induction. Interestingly, it has recently been shown that the sle1 susceptibility locus of the NZM mouse leads to up-regulation of CD22, an inhibitory coreceptor to the BCR (49). This study shows that the threshold needed for negative selection or central tolerance of B cells determine whether a host is susceptible or resistant to Ag-induced autoimmunity. Strain-specific differences in this threshold may be subtle and, under most circumstances, may not adversely affect immune function. Certain antigenic stimuli, however, may reveal a genetic predisposition to greater autoreactivity. It is certainly the case that autoantibodies arise in the course of a response to many microbial pathogens. In some individuals, this autoreactivity may achieve a sufficient titer to cause tissue damage. A critical difference between BALB/c and DBA/2 appears to reside in the strength of BCR signaling. Molecules that regulate strength of BCR signaling may, therefore, constitute an important new therapeutic target in SLE. We would speculate that there exists a subset of individuals with a B cell autonomous predisposition to autoreactivity and to SLE. Interventions that alter the strength of BCR signaling without altering the B cell-T cell interface or the T cell repertoire may have a therapeutic potential. 1 C.W. and M.K. contributed equally to this study. 3 Abbreviations used in this paper: SLE, systemic lupus erythematosus; BCR, B cell receptor; PPD, purified protein derivative. Erikson, J., M. Z. Radic, S. A. Camper, R. R. Hardy, C. Carmack, M. Weigert. 1991. Expression of anti-DNA immunoglobulin transgenes in non-autoimmune mice. Nature 349:331. Nemazee, D. A., K. Burki. 1989. Clonal deletion of B lymphocytes in a transgenic mouse bearing anti-MHC class I antibody genes. Nature 337:562. Avrameas, S., T. Ternynck. 1995. Natural autoantibodies: the other side of the immune system. Res. Immunol. 146:235. Mouthon, L., M. Haury, S. Lacroix-Desmazes, C. Barreau, A. Coutinho, M. D. Kazatchkine. 1995. Analysis of the normal human IgG antibody repertoire: evidence that IgG autoantibodies of healthy adults recognize a limited and conserved set of protein antigens in homologous tissues. J. Immunol. 154:5769. Tan, E. M.. 1989. Antinuclear antibodies: diagnostic markers for autoimmune diseases and probes for cell biology. Adv. Immunol. 44:93. Foster, M. H., B. Cizman, M. P. Madaio. 1993. Nephritogenic autoantibodies in systemic lupus erythematosus: immunochemical properties, mechanisms of immune deposition, and genetic origins. Lab. Invest. 69:494. Morel, L., C. Mohan, Y. Yu, B. P. Croker, N. Tian, A. Deng, E. K. Wakeland. 1997. Functional dissection of systemic lupus erythematosus using congenic mouse strains. J. Immunol. 158:6019. Vyse, T. J., C. G. Drake, S. J. Rozzo, E. Roper, S. Izui, B. L. Kotzin. 1996. Genetic linkage of IgG autoantibody production in relation to lupus nephritis in New Zealand hybrid mice. J. Clin. Invest. 98:1762. McDevitt, H. O.. 1998. The role of MHC class II molecules in susceptibility and resistance to autoimmunity. Curr. Opin. Immunol. 10:677. Desai-Mehta, A., L. Lu, R. Ramsey-Goldman, S. K. Datta. 1996. Hyperexpression of CD40 ligand by B and T cells in human lupus and its role in pathogenic autoantibody production. J. Clin. Invest 97:2063. Datta, S. K., S. L. Kalled. 1997. CD40-CD40 ligand interaction in autoimmune disease. Arthritis Rheum. 40:1735. Sfikakis, P. P., R. Oglesby, P. Sfikakis, G. C. Tsokos. 1994. B7/BB1 provides an important costimulatory signal for CD3-mediated T lymphocyte proliferation in patients with systemic lupus erythematosus (SLE). Clin. Exp. Immunol. 96:8. Tsokos, G. C., B. Kovacs, P. P. Sfikakis, S. Theocharis, S. Vogelgesang, C. S. Via. 1996. Defective antigen-presenting cell function in patients with systemic lupus erythematosus. Arthritis Rheum. 39:600. Gross, J. A., J. Johnston, S. Mudri, R. Enselman, S. R. Dillon, K. Madden, W. Xu, J. Parrish-Novak, D. Foster, C. Lofton-Day, et al 2000. TACI and BCMA are receptors for a TNF homologue implicated in B-cell autoimmune disease. Nature 404:995. Roark, J. H., C. L. Kuntz, K. A. Nguyen, A. J. Caton, J. Erikson. 1995. Breakdown of B cell tolerance in a mouse model of systemic lupus erythematosus. J. Exp. Med. 181:1157. Hirose, S., K. Yan, M. Abe, Y. Jiang, Y. Hamano, H. Tsurui, T. Shirai. 1997. Precursor B cells for autoantibody production in genomically Fas-intact autoimmune disease are not subject to Fas-mediated immune elimination. Proc. Natl. Acad. Sci. USA 94:9291. Gatenby, P. A., M. Irvine. 1994. The bcl-2 proto-oncogene is overexpressed in systemic lupus erythematosus. J. Autoimmun. 7:623. Cope, A. P.. 1998. Regulation of autoimmunity by proinflammatory cytokines. Curr. Opin. Immunol. 10:669. Llorente, L., W. Zou, Y. Levy, Y. Richaud-Patin, J. Wijdenes, J. Alcocer-Varela, B. Morel-Fourrier, J. C. Brouet, D. Alarcon-Segovia, P. Galanaud, et al 1995. Role of interleukin 10 in the B lymphocyte hyperactivity and autoantibody production of human systemic lupus erythematosus. J. Exp. Med. 181:839. Tsokos, G. C., D. T. Boumpas, P. L. Smith, J. Y. Djeu, J. E. Balow, A. H. Rook. 1986. Deficient γ-interferon production in patients with systemic lupus erythematosus. Arthritis Rheum. 29:1210. Bolland, S., J. V. Ravetch. 2000. Spontaneous autoimmune disease in FcγRIIB-deficient mice results from strain-specific epistasis. Immunity 13:277. Salmon, J. E., S. Millard, L. A. Schachter, F. C. Arnett, E. M. Ginzler, M. F. Gourley, R. Ramsey-Goldman, M. G. Peterson, R. P. Kimberly. 1996. FcγRIIA alleles are heritable risk factors for lupus nephritis in African Americans. J. Clin. Invest. 97:1348. Duits, A. J., H. Bootsma, R. H. Derksen, P. E. Spronk, L. Kater, C. G. Kallenberg, P. J. Capel, N. A. Westerdaal, G. T. Spierenburg, F. H. Gmelig-Meyling, et al 1995. Skewed distribution of IgG Fc receptor IIa (CD32) polymorphism is associated with renal disease in systemic lupus erythematosus patients. Arthritis Rheum. 38:1832. Wu, J., J. C. Edberg, P. B. Redecha, V. Bansal, P. M. Guyre, K. Coleman, J. E. Salmon, R. P. Kimberly. 1997. A novel polymorphism of FcγRIIIa (CD16) alters receptor function and predisposes to autoimmune disease. J. Clin. Invest. 100:1059. Nishizumi, H., I. Taniuchi, Y. Yamanashi, D. Kitamura, D. Ilic, S. Mori, T. Watanabe, T. Yamamoto. 1995. Impaired proliferation of peripheral B cells and indication of autoimmune disease in lyn-deficient mice. Immunity 3:549. Tedder, T. F., M. Inaoki, S. Sato. 1997. The CD19-CD21 complex regulates signal transduction thresholds governing humoral immunity and autoimmunity. Immunity 6:107. Bignon, J. S., K. A. Siminovitch. 1994. Identification of PTP1C mutation as the genetic defect in motheaten and viable motheaten mice: a step toward defining the roles of protein tyrosine phosphatases in the regulation of hemopoietic cell differentiation and function. Clin. Immunol. Immunopathol. 73:168. Cyster, J. G., J. I. Healy, K. Kishihara, T. W. Mak, M. L. Thomas, C. C. Goodnow. 1996. Regulation of B-lymphocyte negative and positive selection by tyrosine phosphatase CD45. Nature 381:325. Gaynor, B., C. Putterman, P. Valadon, L. Spatz, M. D. Scharff, B. Diamond. 1997. Peptide inhibition of glomerular deposition of an anti-DNA antibody. Proc. Natl. Acad. Sci. USA 94:1955. Putterman, C., B. Diamond. 1998. Immunization with a peptide surrogate for double-stranded DNA (dsDNA) induces autoantibody production and renal immunoglobulin deposition. J. Exp. Med. 188:29. Khalil, M., K. Inaba, R. Steinman, J. Ravetch, B. Diamond. 2001. T cell studies in a peptide-induced model of systemic lupus erythematosus. J. Immunol. 166:1667. Wells, S. M., A. B. Kantor, A. M. Stall. 1994. CD43 (S7) expression identifies peripheral B cell subsets. J. Immunol. 153:5503. Spatz, L., V. Saenko, A. Iliev, L. Jones, L. Geskin, B. Diamond. 1997. Light chain usage in anti-double-stranded DNA B cell subsets: role in cell fate determination. J. Exp. Med. 185:1317. Offen, D., L. Spatz, H. Escowitz, S. Factor, B. Diamond. 1992. Induction of tolerance to an IgG autoantibody. Proc. Natl. Acad. Sci. USA 89:8332. Goodnow, C. C., J. Crosbie, S. Adelstein, T. B. Lavoie, S. J. Smith-Gill, R. A. Brink, H. Pritchard-Briscoe, J. S. Wotherspoon, R. H. Loblay, K. Raphael, et al 1988. Altered immunoglobulin expression and functional silencing of self-reactive B lymphocytes in transgenic mice. Nature 334:676. Sinha, A. A., M. T. Lopez, H. O. McDevitt. 1990. Autoimmune diseases: the failure of self tolerance. Science 248:1380. Cohen, P. L., R. A. Eisenberg. 1991. lpr and gld: single gene models of systemic autoimmunity and lymphoproliferative disease. Annu. Rev. Immunol. 9:243. Su, T. T., D. J. Rawlings. 2002. Transitional B lymphocyte subsets operate as distinct checkpoints in murine splenic B cell development. J. Immunol. 168:2101. Grimaldi, C. M., J. Cleary, A. S. Dagtas, D. Moussai, B. Diamond. 2002. Estrogen alters thresholds for B cell apoptosis and activation. J. Clin. Invest. 109:1625. Carsetti, R., G. Kohler, M. C. Lamers. 1995. Transitional B cells are the target of negative selection in the B cell compartment. J. Exp. Med. 181:2129. Hartley, S. B., C. C. Goodnow. 1994. Censoring of self-reactive B cells with a range of receptor affinities in transgenic mice expressing heavy chains for a lysozyme-specific antibody. Int. Immunol. 6:1417. Vratsanos, G. S., S. Jung, Y. M. Park, J. Craft. 2001. CD4+ T cells from lupus-prone mice are hyperresponsive to T cell receptor engagement with low and high affinity peptide antigens: a model to explain spontaneous T cell activation in lupus. J. Exp. Med. 193:329. Mohan, C., L. Morel, P. Yang, H. Watanabe, B. Croker, G. Gilkeson, E. K. Wakeland. 1999. Genetic dissection of lupus pathogenesis: a recipe for nephrophilic autoantibodies. J. Clin. Invest. 103:1685. Jongstra-Bilen, J., B. Vukusic, K. Boras, J. E. Wither. 1997. Resting B cells from autoimmune lupus-prone New Zealand Black and (New Zealand Black × New Zealand White)F1 mice are hyper-responsive to T cell-derived stimuli. J. Immunol. 159:5810. Sobel, E. S., M. Satoh, Y. Chen, E. K. Wakeland, L. Morel. 2002. The major murine systemic lupus erythematosus susceptibility locus Sle1 results in abnormal functions of both B and T cells. J. Immunol. 169:2694.